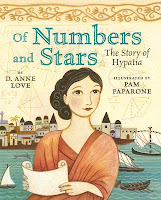 Of Numbers and Stars: The Story of Hypatia by D. Anne Love, illustrated by Pam Paparone. Grades 2-5. Holiday House, 2006. Unpaged. Reviewed from library copy. In the fourth century, not many women were educated, even in the progressive city of Alexandria in Egypt. But Hypatia was not like other girls. Her father, a professor, valued education and he decided to teach Hypatia just as if she'd been a boy. While other girls watched from their windows, Hypatia learned to swim, fish, ride a horse, read, and write. When Hypatia discovered arithmetic, her interest was piqued and her father taught her geometry and astronomy as well. Hypatia became known as a respected scholar and a symbol of educated women for centuries to come! Funny story. I was pulling books for our Women's History Month display and this title was listed on one of the Amelia Bloomer Project lists. I had never heard of it, but as soon as I pulled it off the shelf and took a gander at the cover, I knew I wanted to sit down and read it. As soon as I read it, I knew I wanted to review it here so that other people would know about it. As I was sitting at the reference desk, jotting down my thoughts, a patron saw the book laying in front of me on the desk and said, "Oooh, what's that one?" I did a quick booktalk and urged her to take it home with her (which she did). Put this one face-out and I guarantee you it'll check out! Beautiful art perfectly compliments the carefully chosen words in this informational picture book, making it a surefire bet for Women's History Month. The gorgeous art spreads evoke a sense of the time and place, pulling the reader right into 4th century Egypt. The soft blues, greens, and earthy browns made me feel like I was sitting by the water with a cool breeze washing over me. Ms. Paparone also incorporates depictions of the subjects Hypatia's learning about into her spreads. Biographies (especially of little-known, but very cool people) are my favorite kind of informational picture book and this one was right up my alley. It obviously takes a great deal of research to write a book on someone from the 4th century and D. Anne Love includes a lovely author's note and bibliography, as well as some additional notes about mathematics. This book will make a great choice for Women's History Month and I'd try it on kids who are fascinated by scientific biographies like Starry Messenger by Peter Sis or The Librarian Who Measured the Earth by Kathryn Lasky. Of Numbers and Stars is on shelves now! Happy Nonfiction Monday! This week's roundup is over at Practically Paradise, so check it out!